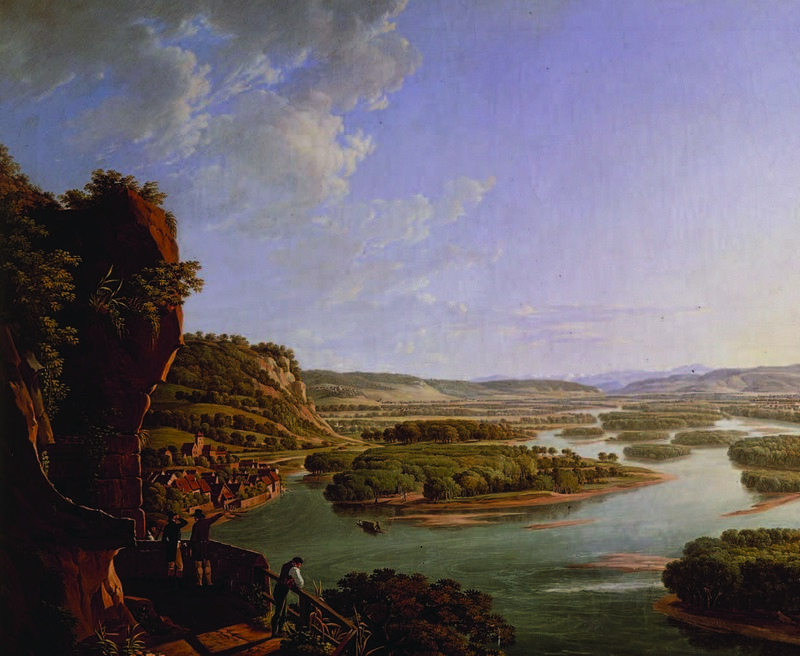 Peter Birmann’s View of the Rhine from the Istein Cliffs Upriver (1859) depicts what is called "the furcation zone" of the Upper Rhine. Human dominion over the natural world is ubiquitous in this age, so that now one practically takes it for granted. But as Blackbourn, Coolidge professor of history since 1997, demonstrates time and again in The Conquest of Nature: Water, Landscape, and the Making of Modern Germany, the power to effect change is not the same thing as mastery. With rich language, economy of expression, and masterly rendered descriptions of technical subjects, the new book “tells the story of how Germans transformed their landscape over the last 250 years by reclaiming marsh and fen, draining moors, straightening rivers, and building dams in the high valleys,” writes Blackbourn. Such interventions were not new, but their scale and impact after 1750 “changed the face of the land as much as familiar and obvious symbols of the modern age like the factory chimney, the railway, and the burgeoning city.” His account of attempts to control waterwhere and when it flows, how fast and how deep, and to whose benefitprovides a striking portrait of the German state. And yet, while cleaving to its German subject matter in exquisite, carefully researched detail, the book is much more than the sum of its parts. From the meticulous descriptions of environmental consequences good and bad, from the confident pronouncements of one generation of engineers after another, emerge a complex portrait of humanity’s relationship with the rest of nature. From this history of how the German state sought to instrumentalize the environmentplants, animals, and even peopleemerges a universal story, rich in ironies. This is that rare transcendent work that finds application again and again. David Blackbourn in Adolphus Busch Hall, in the Gunzburg Center for European Studies. Blackbourn begins the story in the 1730s, when the future Frederick the Great of Prussia was 18. In an attempt to escape his overbearing father, Frederick William I, the prince and a friend tried to flee the kingdom, but were caught and tried as deserters. Frederick’s friend was initially sentenced to prison, but the king ordered the young man beheaded and Frederick was forced to watch the execution. For the next two and half months, he lived under guard in the fortress of Küstrin. He was then released to “learn economics from the ground up” by working in the local provincial administration of the Upper Oderbruch, a waterlogged, low-lying agricultural region along the Oder River, where the water meandered through a maze of islands and marshes. Frederick spent his time inspecting buildings, animals, and fields. In the undrained wetlands of the region he saw room for expansion and improved production. The Oderbruch would never be the same. A patchwork quilt of geometrical settlement in the Oderbruch as seen from the air sometime before World War II. The beauty of this “blooming garden” belies the pollution of surrounding waterways by fertilizer runoff and human waste. Blackbourn does not subscribe to a “great man” view of history. But, he says, “If you pose the counter-factual question at its most brutal”would Germany have remade the landscape in the way that it did had there been no Frederick the Great?“obviously not.” And so German land reclamation on a grand scale got its violent start. Beginning around 1750, Frederick imported engineers to drain and “reclaim” hundreds of thousands of acres of marshland for agriculture, in part by shortening the course of the Oder by 15 miles. This had the intended effects of speeding the flow of water, improving navigability, and reducing the cost of the project. “Here I have conquered a province in peace,” Frederick proclaimed when the job was donethough he was forced to call in the military to guard the construction and used soldiers as laborers to speed the work. Subsequent reclamation followed a similar pattern. The Dromling Marsh alone, “twenty-six miles long and thirteen miles wide...yielded over 220,000 acres of new land,” writes Blackbourn. The reclaimed land was settled by colonists, ethnic Germans brought in from outside Prussia, who were expected to run productive farms. Later projects were even more ambitious, but followed a similar pattern: drain the wetlands, then move in human populations who could maximally utilize the new resource. In the early nineteenth century, for example, “The Rhine between Basel and Worms was shortened from 220 to 170 miles, almost a quarter of its length....Dozens of cuts were made, more than twenty-two hundred islands removed.” This was viewed as heady progress, a wholesale transformation of the landscape to create new arable territory, whose later consequences, as Blackbourn tells it, were not entirely foreseen. The wholesale destruction of the existing ecology brought benefits such as the elimination of malaria, but the draining and diking of the river’s floodplains led to more frequent and severe changes for the farms, villages, and cities that had been built along the riverbanks. Some communities were actually washed away. A man-made canal in Berlin, from the frontispiece of Blackbourn’s book. The state approach to dealing with floods was the opposite of accommodation. It was war. When it became clear that the “improvements” made by the first generation of engineers had worsened flooding by, for example, speeding the flow of water, later engineers proposed new technological solutions. Rather than adjust to natural cycles, or give the straitjacketed river some room to overflow, they instead proposed the construction of countless dams on the Rhine’s tributaries to better regulate the flow of water. The same language of conquest that had been applied to reclamation now became associated with dam-building. But, Blackbourn notes, dams ultimately defeat their own purpose: as they fill with silt, their capacity to store and regulate the flow of water diminishes. “History can help us to recognize the power of unintended consequences,” says Blackbourn, “and there is no other area of human endeavor, with the possible exception of war, where the power of unintended consequences is quite so great as it is in human dealings with the environment.” The effect of straightening rivers, ultimately, is to move large amounts of water more quickly to the sea. In times of drought, this hastened the desiccation of the land. And when there were floods, their severity was greatly magnified by the speed of the river. The reality was that none of these supposedly definitive solutionsnot raising the height of dikes after the inundations of the 1770s, not blocking off the ‘Old Oder’ following the 1830 flood, not the major corrective scheme in the 1850s, not the advent of steam pumps and dredgers, not the new plan in the 1920s that used electrically powered pumps, not the repeated reorganizations of Dike Associations, not even socialist conditionsnone of these was able to prevent floods that were now a threat to the work-cycle rather than a part of it. Over a period of more than two centuries, no definitive security against the water could be established in these reclaimed lands. Instead, in a pattern that has become familiar elsewhere, floods eventually became less frequent but more catastrophic when they did occur, right down to the disaster of 1997, the second “once-in-a-century” flood in 50 years. One of the most startling revelations of The Conquest of Nature is the way it connects German natural and social reengineering in the eighteenth and nineteenth centuries to the atrocities committed by the Nazis in the twentieth. To go from the killing of 11 million sparrows (because they eat seed crops) to the killing of Jews may seem an enormous leap intellectually and morally, but as Blackbourn makes clear, the language of conquest, and even the pattern of state behavior, had been established for 250 years. He tells how Germany’s National Socialist Party adopted the language of land reclamation and took to its horrific conclusion the practice of moving the most productive people (in their racist formulation) onto the land, just as Frederick the Great had done. Jews became animals; displaced Slavs were referred to as Indians. What to do with all the people who had been forced off their farms to make Lebensraum (living space) for German settlers? At first, Blackbourn relates, those who were not fit for working, the women and children, were forced to march into Russia at gunpoint. The first victims of systematic mass gassings were mental patients housed in Polish port cities, killed to accommodate the massive influx of ethnic German immigrants. Eventually this barbaric, utilitarian calculus led to the mass killings perpetrated at concentration camps. Killing and land reclamation became so perversely entwined that at one point, a reference to sending people to the marshes became a euphemism for extermination. Hitler even invoked the genocide of the Indians of the North American plains (an important source of grain for the world, the Führer noted) as a kind of “moral alibi” for Nazi crimes. Though Blackbourn does not entirely accept the analogy, neither does he believe in German exceptionalism, the idea that Germany took a path before World War II that was so different from any other nation’s. Reassuringly, he sees a reformed Germany today. Modern Germans will “own” the Holocaust for centuries to come, he believes, and are consequently highly sensitive and attuned to the dangers of bigotry. Their progress is evident in their dealings with nature and with their neighbors, Poland and the former Czechoslovakia. After the devastating floods along the length of the Oder in 1997, Poland planned a series of large-scale, German-style engineering projects to protect the Polish countryside. Downstream Germans, for whom the flooding would be intensified, protested. But there was widespread appreciation of the irony that Poland was merely trying to do what Germany itself had done in the past, and a clear understanding that because the river knows no borders, any solution will have to be international. Jan Brueghel the Elder’s Interior of Woods with Huntsman depicts “the ecological old regime,” notes Blackbourn. Such wooded swamps, later reclaimed for farmland, were frequently hunting preserves owned by the nobility. Their hydrology and ecology, which included large populations of deer, were often the result of human intervention. Though these areas were by no means pristine wilderness untouched by the hand of man, it is still possible to quantify the damaging effects of their loss. Additional images may be viewed in the accompanying PDF. The “cut” in the Rhine at New Pfotz, 1829. To shorten the river, “A channel would be cut along the predetermined new course” allowing the water to “follow the line of least resistance and rush through the shorter route, eventually widening the artificial channel through the power of its current.” However, it took years for the river to become established in a new bedin the most extreme case, five decades. A map of the course of the Rhine in 1789 shows how the river snaked across a massive ﬂoodplain, constantly changing course in what is called the meander zone. “The basic dynamics were simple,” writes Blackbourn. “Even when the river’s flow was sluggish, the water on the outside of the bends would speed up (to compensate for the greater distance it needed to travel), eroding the far bank and depositing sediment on the near one. Over time, the loops became so pronounced and the neck of the loop so narrow that the river almost doubled back on itself.... In some places the ﬂoodplain stretched for miles, and at some point in its long history the Rhine would use all of it.” Projects to straighten rivers shortened them and sped the water along: in one project alone, the Rhine between Basel and Worms was shortened by 50 miles. The fortress at Küstrin, arguably the place where German land reclamation got its brutal start after the future Frederick the Great was imprisoned there by his father. Today, wetlands encroach on the ruins.